The main man behind this band is Something Corporate’s Andrew McMahon. According to a friend who saw him play with Something Corporate about five years ago, he is amazing live; he treats his piano in much the same way Ben Folds does – believing that the keys aren’t the only part of the instrument that should be played. McMahon was diagnosed with leukemia a few years ago, but has undergone treatment and is now in recovery. 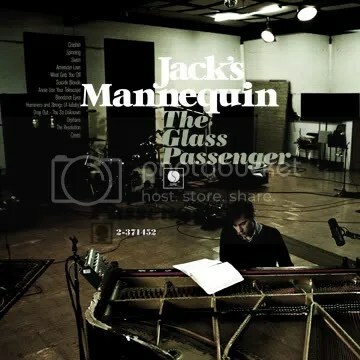 This is the second album for Jack’s Mannequin. It is very polished piano-pop with ’emo’ leanings. I really enjoyed the song “Caves,” which tops the seven-minute mark. Recommended if you like Jimmy Eat World’s newer stuff, Dashboard Confessional, The Fray, and bands of a similar nature. This entry was posted on October 8, 2008 at 12:00 pm and filed under TheSlacker. You can follow any responses to this entry through the RSS feed.